Location: Miglos, in the Ariège departement of France (Midi-Pyrenees Region). 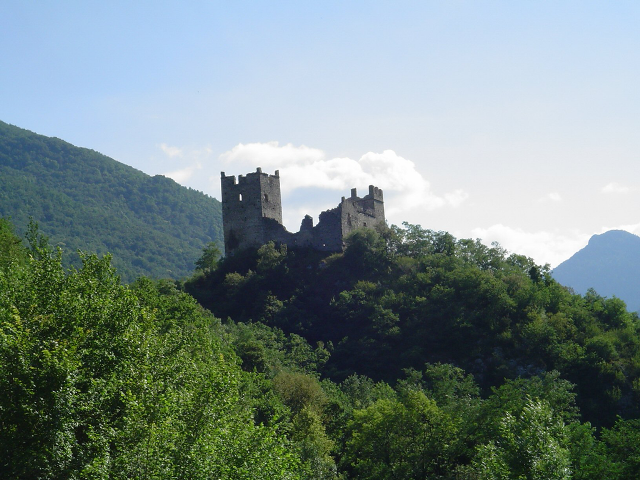 Notes: Château de Miglos is located in the Pyrenees in Vicdessos Valley.The fortress was part of a defensive system that protected the county of Foix and included, in addition to the castles of Montreal de Sos, Quié, Génat, Castel Merle, several fortified caves (or spoulga). If the locality and the church of Miglos are attested in 1097, and a Lord of Miglos city in 1160, the first mentions of the castle date back to speak 1213. The castle was then part of the guarantees offered by the Count of Foix the King of Aragon to prove his good faith and his allegiance to the Church during the Albigensian Crusade. In 1244, the lord of Miglos Arnaud, questioned by the Inquisition, admitted having received the Perfect in his home and sent arms to the besieged Montsegur, which led to his being jailed for four years. In 1311, Gaston I of Foix offers the lordship of Miglos Bernard Usson (or Her). currently visible vestiges reflect the state of the castle in the fourteenth century, after the restoration Bernard Usson effected in 1320.